Cheese and potatoes--the greatest marriage of flavors that has ever been discovered. Seriously, I think my death bed request for my final meal will be some form of cheese and potatoes. Because when I think of cheese and potatoes together, I think about the ultimate comfort food. These Cheesy Hasselback Potatoes are ooey, gooey and crispy in all the right places. 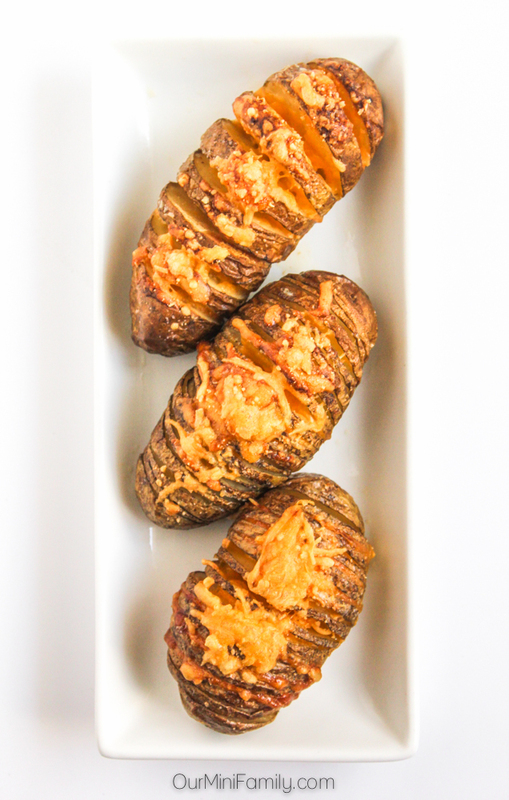 Baked potatoes will never be the same in our house--today, I'm sharing the recipe for these cheesy baked, hasselback potatoes! Wash and dry your potatoes. 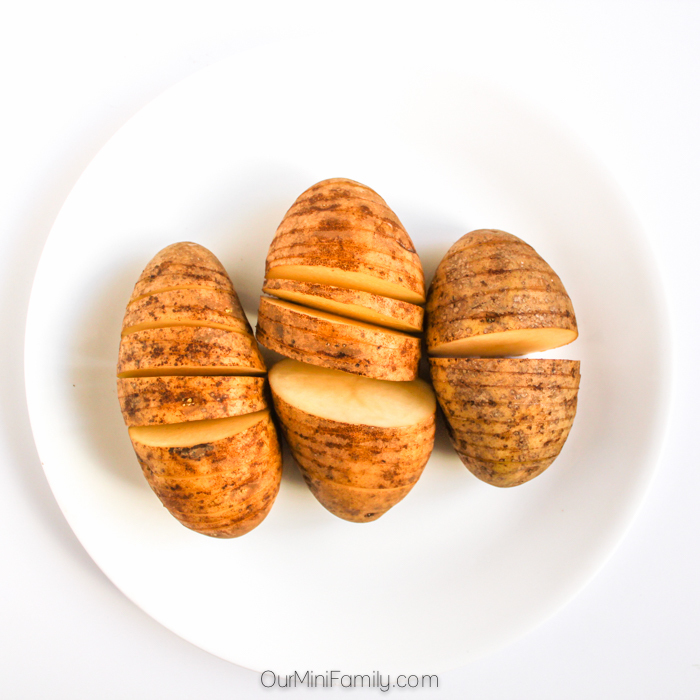 Using a sharp knife, cut the potatoes about 3/4 of the way (make slices into them, but don't cut all the way so that it becomes separated from the rest of the potato). Cut all the way to the other side. Slice a small sliver of butter and place it in-between two slices of potato. Repeat until there is a small piece of butter in between each slice. Grab a small handful of cheddar cheese and place some shredded cheese in between each layer and place it on top of the butter. Repeat until there is cheese in between each potato slice. Pour about 1 1/2 tablespoon of oil on top of each potato. Sprinkle each potato with a small amount of salt. Sprinkle extra cheese on top of each potato before baking. Bake the potatoes in the oven for 45-55 minutes (check tenderness of potato after 45 mins). 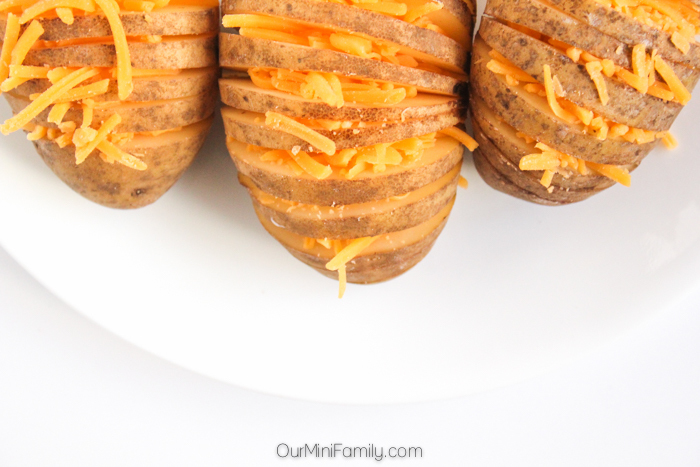 These Cheesy Hasselback Potatoes are seriously so good! When Adam and I made these the other day, it hit the spot and satisfied our cravings for fast food (we're really trying to cut back on that). Adam and I have been thinking that these potatoes would be a great side dish to serve at a smaller Super Bowl party. We're planning on hosting a party for the big game, and I know that our friends love cheese. And potatoes. So yeah, it's kind of a no-brainer! 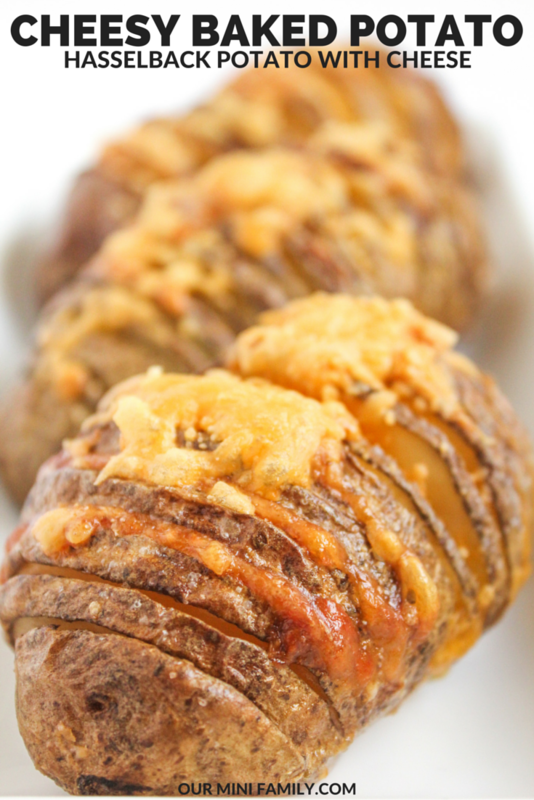 I'm definitely going to make these hasselback potatoes for our Super Bowl party! What are some of your favorite cheesy potato foods? Another favorite of mine is cheesy tater tots! Be sure to comment below and let me know what some of your favorite other recipe ideas are! What's your "last meal" request? Mine is definitely some form of cheese and potatoes! Comment below and let us know. Oh now I can see this becoming a family classic. Looks delicious and it's so presentable too! Yeah it's certainly become a family favorite for us! I hope you get to make them really soon and that you love them! Wow! My dad would absolutely love these, he loves potatoes and cheddar cheese. I'm going to have to make them for him! Hope your dad enjoys them as much as we did! I think it would be one of my last requests too. I would have a banquet purely made out of cheese and potato lol! Yum! These look awesome! And incredibly easy. I think that my kids would really enjoy them. We do a lot of baked potatoes in the winter. Thank you! Yes, we love baking potatoes in the winter too. Hope you give them a try! 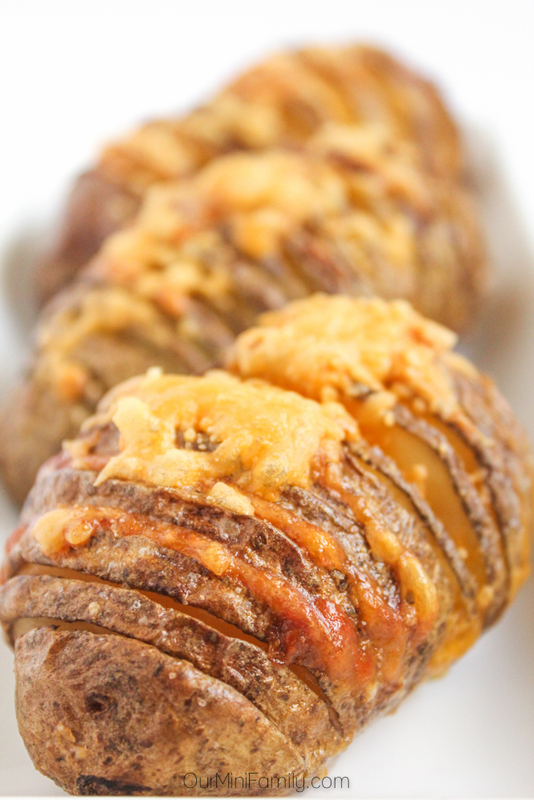 I've always wanted to try making hasselback potatoes. I'm not even sure why I haven't. Looks delicious! They are so easy to make! If you love potatoes, it's definitely worth the extra effort! Oh wow…that pic of the cheesy potatoes looks delicious. I love how it's sliced and filled with cheese. I'm definitely going to have to do something like this. Mmm yes! The sliced potato with cheesy goodness is just a killer combo! Oh my word, this looks incredible! I may have to make this for my date night this week! It would definitely be yummy, date night comfort food for sure!